Barbadian pop singer Rihanna has to be one of the hardest-working woman in popular music right now. The talented singer's most recent single, the Calvin Harris-produced "We Found Love" recently became her ninth #1 Billboard Hot 100 single (eleventh if you count her collaborations with Eminem and T.I.) and the song's album, Talk That Talk became her sixth top ten album, the last three of which were top five hits. Astonishing! Looking back on her rather extensive discography, Rihanna has released one album every year for the past three years, amassing nine Billboard Hot 100 #1 singles. Since the beginning of her career back in 2005, Rihanna has made smart business decisions. After the success of her debut single, the incredibly infectious "Pon De Replay" (which peaked at #2), Rihanna went ahead and released single #2, the BLAH R&B number, "If It's Lovin' That You Want." When that single failed to reach the top 20, Rihanna got to work on album number 2. Why empty water from a sinking ship when you can just get a new ship? Rihanna really knows hot to keep the momentum going. My only concern is that she's going to wear herself out. Girl needs a serious break! "We Found Love" was both written and produced by Scottish singer/songwriter/producer Calvin Harris, taking Princess RiRi straight to the club. Rihanna's recent string of hits have hit everywhere on the pop spectrum from dance pop to R&B pop, even straight up R&B and hip-hop. "We Found Love" is the singer's first strictly club single (assuming you don't count her David Guetta collaboration) and I can't get enough of it. The intro is a little long but once those trademark Calvin Harris beats start bumping, that's when the real party really starts. 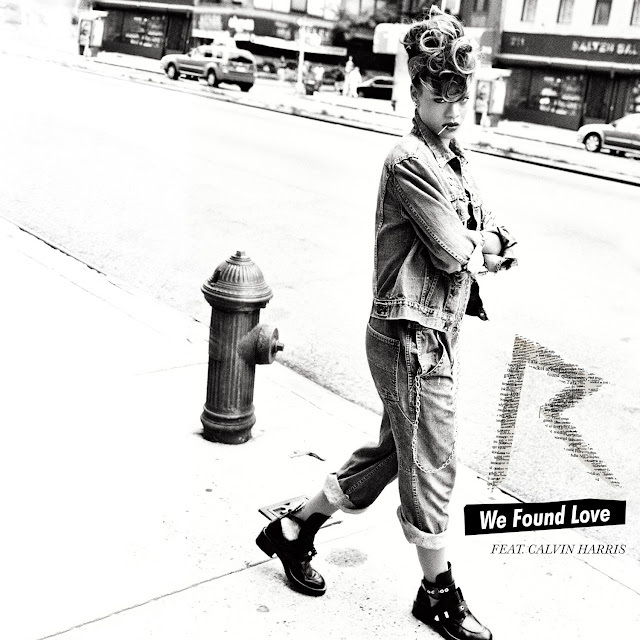 As exciting as it must be for Rihanna to have her ninth #1 single, "We Found Love" becomes Calvin Harris' first #1 single in America. Amazing! Two birds, one stone. Check out the Melina Matsoukas-directed video clip below and prepare to get dizzy. As fun and up-tempo as the song is, the video paints an entirely different picture. The video includes drug addiction, an abusive relationship (verbal more so than physical)...it's fast moving and dark, which is in serious contrast to the dance party like feel of the song. Whenever I hear the song at a party, I prefer to block out the rough imagery of the video and just get lost in the music, but kudos to Rihanna for tackling such difficult subject matter. Look for remixes by Chuckie, Cahill, and R3hab, all available on U.S. iTunes HERE. New single, the Dr. Luke, Cirkut-produced "You Da One" is already climbing the charts, most recently arriving at #14. Looks like RiRi has another top ten single on her hands folks!